Few acting tasks are quite as thankless as the anguished movie scream, especially for men. When an actor can’t pull one off, of course, they risk universal ridicule (or worse, meme-hood). But even when a fine actor like Andrew Garfield in an otherwise fine film like Never Let Me Go sheds all restraint and bellows a scream from the depths of his soul, there will still be some smartass in the audience (read: me) who can’t help giggling a little because his voice goes all squeaky and his limbs go spaghetti wobbly*. One chortle leads to another chuckle or two, and in the complicated emotional dynamics of movie-going, even a hint of audience laughter skews the moment for everyone (in my defense, I swear I wasn’t the instigator). 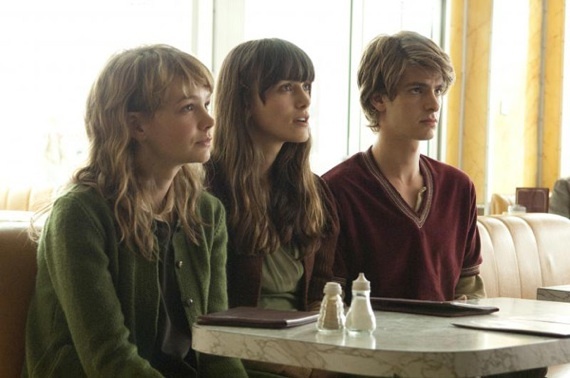 This is particularly unfortunate for Never Let Me Go, the new film from director Mark Romanek, because that moment is one of the very few instances where the film attempts to express something other than quiet, stately melancholy (even if it is just loud, angry melancholy). For all its considerable strengths, Go suffers from emotional monotony – the experience of watching it is somewhat akin to holing up in your room with a pair of headphones and looping a single Elliott Smith song for two hours, lingering on one very specific shade of a mood for far too long. That said, viewers who don’t mind getting in touch with their morose inner teenager for a bit will also find a smart, well-acted, beautifully shot allegory here – it goes for the mind even if it compulsively yanks the heartstrings. The film focus on three students at a British academy in the countryside which might seem like a picturesque ideal if not for the off-kilter touches lurking in the periphery – the constant chimes of tracking bracelets, the regular rations of pills, the ominous whispers about their future. As it turns out, dystopia has come to the UK wrapped in the refined cloth of boarding school privilege, and this Manchurian Candidate of a film has gruesome sci-fi truth lurking underneath its prestige picture trappings (suffice it to say that the children have had a certain driver’s license question answered for them). The students themselves vaguely understand the fate that awaits them, but they remain more interested in each other, starting a love triangle that continues into adulthood, with Garfield and Keira Knightley as a couple and Carey Mulligan as the desperately lovelorn observer. Over the course of the film, the three all struggle mightily to win each other’s affections. What they don’t struggle against, curiously, is the cruel system that shortens their lifespan and determines their fates, meeting it only with sorrowful acceptance. In metaphorical terms, this makes sense – the film is based on a novel by Kazuo Ishiguro (Never Let Me Go (Movie Tie-In Edition) (Vintage International) ) who has written often about repressive societies ruled by conformity, and as the film’s final voiceover rather obnoxiously spells out, this is also a Metaphor about Life™. In filmmaking terms, however, it feels off. Resignation is obviously less cinematic than rebellion, anger, disgust, fear, or any of the other reactions that one might reasonably expect from victims of such a nightmarish scenario, and Romanek’s general omission of any of these responses feels a bit too pat. But Go is still a step above your average tearjerker. Romanek , a music video veteran who directed the highly-acclaimed clips for Johnny Cash’s “Hurt” and Jay-Z’s 99 Problems, has a talent for packing implication and meaning into even fragments of moments. And the performances are stellar. Carey Mulligan, whose garrulous, confident charm in An Education prompted more than a few comparisons to Audrey Hepburn, proves her versatility with a performance as a reserved, shy loner that manages to be just as affecting. She keeps you watching – it seems that she may be one of those actresses, the kind with the skill and grace to levitate over even the clunkiest material. She was even thoroughly compelling in the trashy Wall Street: Money Never Sleeps – pair her with material of any merit, and she’s unstoppable. *You can see the scream here (at 1:59). Of course, the trailer editors quickly add a slow motion effect and cut out the remaining 15-20 seconds of screaming, which progressively got more funny and/or heartrending. I can’t explain why I think the “documentary” Catfish is sleazy exploitation made by scumbags without spoiling the “twists” that the film’s publicity materials have tried so hard to play up. I will grudgingly admit, though, that as a piece of entertainment, Catfish is actually sort of decent. The film tells the story of a young New Yorker who strikes up an unlikely Facebook friendship with a young girl, which leads to an even more unlikely Facebook relationship with the girl’s gorgeous older sister. What follows is, of course, not what it seems, detailing one of the few types of relationships that may actually merit the status “it’s complicated” (of course, if that surprises you, I’ve got a social networking site to sell you). Drawing on a huge archive of footage – a flip-cam seems to have caught our protagonist’s every waking moment – directors Ariel Schulman and Henry Joost craft a reasonably gripping thriller that has interesting things to say about the brave new world of online communication. It’s engaging stuff, at least until the con that these guys are pulling starts to trigger your gag reflex. If you think that the filmmakers here are the doe-eyed innocents that they portray themselves as, I’ve got a worldwide system of electronic communication to sell you.